Many successful projects begin with a difficult site. Our client fell in love with this property’s panoramic view of downtown Austin; however, the only buildable area was a narrow strip of land along a high bluff. Our solution was a home that unfolds through a procession of spaces, each revealing a new breathtaking view of the city skyline. 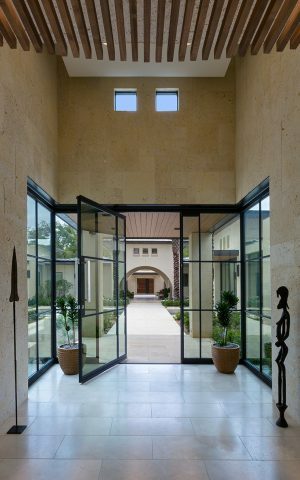 The client’s lifestyle placed a premium on the exchange between indoor and outdoor spaces. These connections were achieved through ample use of glass, inclusion of two interior courtyards, and large pocketing doors that open onto the expansive rear terrace. Amenities include a lap pool, outdoor shower, summer kitchen, and a fireside lounge. The result is an imaginative collection of seamlessly interconnected spaces imbued with simplicity and serenity.